Mallorca Resort Map (Majorca Resort Map) and Tourist Information. The top Brit holiday destination Majorca, Balearic Islands, Spain. This Mallorca Resort Map shows popular Resorts on Mallorca locations Click the name in the right column below to highlight the location on the map. "From Palma's cosmopolitan seafront to the rugged beauty of the Tramuntana mountains, Majorca is a glittering island full of delightful surprises." It’s easy to see why the Spanish king moved his summer palace to Majorca – this island, the largest of the Balearic chain, is a dazzling jewel in the heart of the Mediterranean. 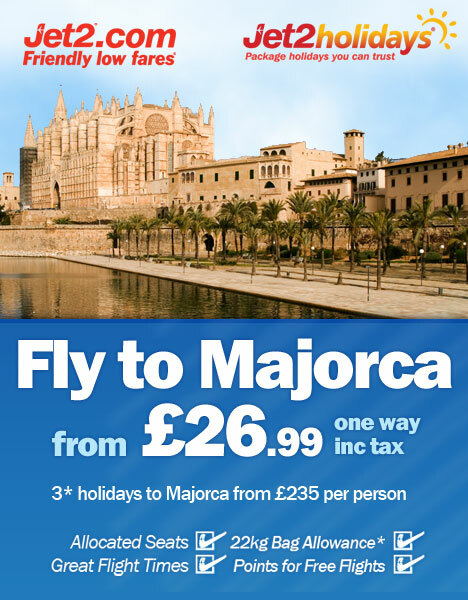 But Majorca isn’t reserved for royalty or the Hollywood stars that frequent its shores - far from it. From non-stop partying in Magaluf to adrenaline-inducing watersports in Cala Millor, from gentle walks through tiny mountainside villages to long tapas lunches in cosmopolitan Palma, there’s something for everyone here. Majorca’s beaches consist of long stretches of sandy coastline in the north and tiny unspoilt pine-clad coves in the east. Cala d’Or has numerous beautiful, powdery coves and deep inlets which can get crowded, simply because of their beauty. Puerto de Soller has a narrow town beach of sand and shingle, and a delightful sandy beach at one end. If you can’t bear to lie still for long, you’ll be spoilt for choice when it comes to watersports. Should they seem a bit too energetic, a trip on a glass bottomed boat is a pleasant and relaxing way to glimpse the colourful underwater life of Majorca. The southern tip of the island is a protected area of glorious white sand beaches. Best beaches include: Cala Mondrago , Cala Pi, Platja de la Rapita, Es Trenc (one part of which is for nudists) and Caló des Màrmol. The northern tip near Alcudia and Pollenca , especially Platja de Muro and Platja de Formentor, are the most beautiful parts of this remote northern coastline. There are lovely coves at Cala Deia and Sa Calobra, often visited by passing yachts. The eastern headland is a Nature Reserve with 42km of Blue Flag beaches including five large sand beaches, of which Platja de Son Moll is the prettiest. South of Capdepera, there are a string of rocky, romantic coves such as Cala Falcó, Cala Romàntica (also known as s'Estany d'en Mas) and Cala Bota. They are harder to get to so often empty in high season. Good for romancing couples. Majorca is renowned for its beautifully crafted artificial pearls. Found in shops all over the island, they make a great value treat or gift. Good buys also include embroidery, olive wood carvings, kitchenware and leather goods - look out for the factories found on the outskirts of most towns. Palma has everything from a wonderful flea market every Saturday to designer boutiques and high street chains, including a large, exclusive department store. Inca market is another excellent market, again with plenty of leather goods, held on Thursday morning and possibly Sunday. Majorca offers a variety of diverse nightlife, ranging from the lively bars, discos and never ending happy hours of Magaluf to the relaxed, seafood restaurants of Puerto Pollensa and Cala d’Or. Majorca has scores of English pubs and restaurants, but those searching for local flavour won't be disappointed - there is often a Balearic ballet or a Spanish play showing at the Auditorium in Palma, one of Europe's top concert halls. As you would expect, nightlife in resorts is quieter and more relaxed during the winter season. Majorca boasts a long and colourful history - its strategic mid-Mediterranean location gave it a part to play in the successive empires of the Phoenicians, Romans, Byzantines and Moors. Sea-front sections of Palma's massive town walls survive to this day, some 800 years after the Moors constructed them. Eating out is one of the great joys of a Majorcan holiday. Local fare includes the Balearics' ubiquitous tapas and all manner of seafood. Charcoal grilled meat dishes, particularly those based on chicken, lamb and pork, are also deservedly popular as is 'arroz brut', the Majorcan equivalent of 'paella', served with steaming saffron rice and pork or chicken. Compliment your meal with a glass of the local red wine, not unlike a mild Rioja and round it off with a delicious 'creme catalan', a rich creme caramel custard. English is widely spoken in the main tourist resorts in tourist hotels, bars and shops. Spanish pronunciations are different from English pronunciations. When using public transport write down your destinatiation and show to the driver when purchasing tickets.